Duck, dive and dodge for Detroit! The sponsors and founders of “Dodgeball in the D” invite Metro Detroiters of all ages, ethnicities and zip codes to come together to positively showcase Detroit by participating in a world record-breaking dodgeball game. Presented by the Dodge brand, organizers expect “Dodgeball in the D” and surrounding family festival activities to draw more than 5,000 people to historic Belle Isle Park in Detroit on Saturday, August 20, 2011. The dodgeball game begins at 1 p.m. on Belle Isle with other family-friendly activities running from 10 a.m. to 3 p.m. Admission to all “Dodgeball in the D” events is free and includes giveaways and food samples from sponsors, while supplies last. 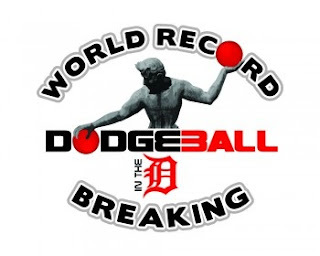 Those wishing to participate in the world record-breaking game itself must register in advance at http://www.DodgeballintheD.com. Additional volunteers and sponsors are still needed. Information on these opportunities also is available at http://www.DodgeballintheD.com. In addition to the game, “Dodgeball in the D” will feature free food, entertainment, information and more for Metro Detroiters of all ages. Activities are divided into five “Xperience” zones: After-School Programs, Non-Profit, Health & Wellness, Family Fun and Sports. Joining the Dodge brand in sponsoring the event are regional business anchors Henry Ford Health System, Crain’s Detroit Business, Health Alliance Plan (HAP) and the Detroit Red Wings. “Dodgeball in the D” is a collaborative effort of several Detroit nonprofit and community organizations led by Detroit Harmonie, ComePlayDetroit, The Youth Connection and Unlimited Xperiences Detroit. Stoudamire is founder of Unlimited Xperiences Detroit. Jacobs is founder of ComePlayDetroit. The event will be held in conjunction with the Youth Connection’s 10th Annual After-School Fair. All activities are free and include: Detroit Red Wings interactive fan experience, Henry Ford Health System career experience, appearance by NHRA Funny Car Racer and Detroit native Brian Olatunji, inflatables, Detroit Fire Department fire truck, caricatures, video games, face painting, health screenings, live DJ, youth sports clinics and demonstrations, singing and dancing demonstrations and more. The dodgeball game will feature two teams constructed of players of all ages, with younger children facing opponents of similar ages to avoid injuries. In case of an emergency, medical services will be available on site. Organizers will document the game according to the standards of Guinness World Records and submit the attempt to Guinness auditors for world-record consideration. Follow “Dodgeball in the D” on Twitter at http://www.twitter.com/DodgeballintheD.